Editor’s note: Brent Engel of Louisiana wrote the following story about Rockne Calhoun for the Hannibal Courier-Post on Oct. 1, 2010. Engel had several requests that it be published again in the wake of the former Pike County judge’s death on April 6. They said he was too slow. They thought he was too short. They wondered why a major college would recruit him. But, as with so many others in later years, they greatly underestimated Rockne Calhoun. The Louisiana High School football star, prep coach, lawyer, prosecutor and associate judge has mellowed little in the 50 years since he was a part of pigskin perfection at the University of Missouri. The 1960 Tigers, who beat Navy in the Orange Bowl, were honored last weekend in Columbia. Calhoun was known to his teammates as The Rock. It was a tough name for a tenacious kid who refused to be caged by perceptions. He offered proof of his talent between the lines, and those who doubted were convinced after they left, or were carried off, the field. In an era before computers and special teams, Calhoun played both offensive tackle, caught his breath for a play or two and went back in on defense without batting an eye. And though age and fate have taken their toll on his 71-year-old body, Calhoun’s spirit is still as strong as Mizzou’s front line from a half-century ago. Calhoun was destined to lug the leather. He was named for Notre Dame star and coach Knute Rockne, and played fullback for his hometown Louisiana Bulldogs. The short, stocky kid was recruited by Mizzou assistant Jim McKenzie, who would go on to coach a year at Oklahoma before dying of a heart attack at age 37. Calhoun made an early impression at what was then known as Memorial Stadium, later to be called Faurot Field. Legendary coach Dan Devine took one look at the Pike County sparkplug and wondered aloud if Mizzou had wasted a scholarship. “He didn’t think I was the material,” Calhoun recalled. Devine, who later would coach at Notre Dame and be portrayed rather unflatteringly in the 1993 movie “Rudy,” was about to get an education. When he wasn’t bringing down the opposition, Calhoun could be counted on to clear a path for the rest of the Tigers. After a 20-15 last-second road victory over Michigan on Sept. 26, 1959, the team left the cold, wet Ann Arbor field only to find itself stranded in a tunnel leading to the locker room. When no one from Michigan would open the doors, Devine asked Calhoun and another lineman to do what they could. The barriers were promptly torn off at the hinges. Devine was as much a father as he was a coach. He didn’t let his players drink during the season or gamble at any time. He also enforced curfews, including a policy that mandated players go to bed by 1 a.m. Saturdays on which they had a game. Devine’s opinion of Calhoun changed over time. At a reunion in 2000, just two years before Devine’s death, the coach’s son-in-law told the Calhoun family that No. 79 was the most hard-nosed player Devine had encountered. The 1960 season was magical. It started when the unranked Tigers outlasted Southern Methodist 20-17 on Sept. 17. Over the next eight weeks, the team easily rolled past opponents such as Penn State and Air Force and rivals such as Kansas State, Nebraska and Colorado. On Nov. 12, Mizzou walloped Oklahoma 41-19, the team’s first victory at Norman in almost a quarter-century. The win propelled the Tigers to the top ranking in the nation. A week later, the despised Kansas Jayhawks came to Columbia for what would be the showdown of the season. 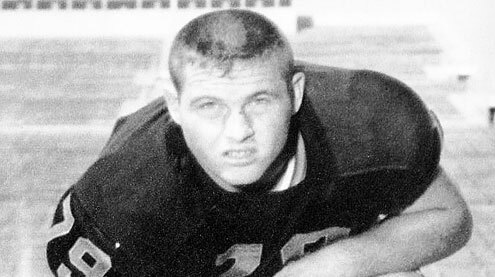 Kansas won the game 23-7, but had to forfeit because it used an ineligible halfback named Bert Coan. That meant Mizzou had a perfect record. Calhoun remembers the team was loaded with talent, including stars Ronnie Taylor, Dan LaRose, Paul Henley, Jerry Wallach and Andy Russell. “We were deep,” he said. The Tigers were invited to the Orange Bowl game in Miami on Jan. 1, 1961. It was the squad’s second straight visit to Florida. Missouri had lost the 1960 contest to a Georgia team led by future pro great Fran Tarkenton. The 1961 game, attended by Navy veteran and president-elect John F. Kennedy, seemed at first as if it would be like Missouri’s six previous losing bowl appearances. But the Tigers’ defense clamped down, holding Navy to just one rushing yard in the first half and keeping All-American Joe Bellino in check. Calhoun had a moment to forget when the Midshipmen tried an on-side kick. Calhoun recovered it, but fumbled the ball as he ran. He claims he was only trying to impress the girls. “That’s why I picked it up and ran with it,” he said with a grin. Missouri won the game 21-14 and ended the season ranked as the nation’s fifth-best team. Though Minnesota was crowned the champion, many analysts thought the honor really belonged to Mizzou. “We were tough,” Calhoun said. After graduating from Mizzou with a degree in physical education, Calhoun spent most of the next decade coaching high school football in Illinois and Missouri. “I had losing seasons right off the bat,” he remembers. In his first campaign at Grant City, Calhoun’s team ended a 27-game losing streak. He wasn’t a stoic coach. “I was more hands-on,” he said with a laugh, admitting the description was a polite way of saying he yelled a lot. Calhoun vented his frustration in other ways, too. Calhoun also coached at Nashville and in the late 1960s started the program at Bowling Green. He loved working with kids. “To see somebody go from not knowing much about football to being a pretty damn good player” was fulfilling, he said. With reluctance, Calhoun gave up his whistle and sponge clipboard to attend law school. He did so because he wanted to earn more money. It turned out to be a less-than-permanent vacation. After getting his law degree from Mizzou in 1971, Calhoun returned to coaching and had his best season in 1974 at Centralia. The Panthers were 10-1. After falling to eventual state champion Country Day 9-6 in the semi-final, the coach had words of advice as his players boarded the bus for home. Calhoun brought to the courthouse the same never-say-die attitude he had on the football field. In 1982, Calhoun was elected Pike County prosecuting attorney. Eight years later, voters chose him as an associate circuit judge. It was a demanding and, sometimes, difficult job, especially when one of his former students came before the court. “That’s as tough as it can be,” said Calhoun, who had to recuse himself from such cases to avoid a conflict of interest. The judge had little patience for repeat offenders, saying they “didn’t get too many chances.” But Calhoun did have a softer side, especially when overseeing adoptions. “That was the fun part,” he said. The keys to success on the bench, Calhoun said, were to listen and be fair. “You see so much in life that’s not fair,” he said. Calhoun retired in 2002, but kept an eye on the legal profession. He believes America needs more headstrong judges. “They have to say what they mean and mean what they say,” he said. A stroke last year slowed Calhoun down a bit, but his mind is still as active as ever. Football remains a passion, as evidenced by the smile on his face upon visiting with more than 30 of his 1960 teammates at last weekend’s reunion. Calhoun always made sure his tackles served as a reminder to opponents of the day they faced Mizzou, and he can’t stand to watch any of today’s professional players go through the motions. Football, as with life, is an all-or-nothing commitment. Calhoun played both ways at tackle in an era when passing was not as common as it is today. Most teams battled it out on the ground. One of Calhoun’s sons, Joe, is coach of the Bowling Green Middle School football team. “I probably threw the ball too much for you last night,” Joe Calhoun admits to his father on a visit this week. Calhoun’s other children are Rich, Randee and Rainee, and he is adamant that they inherited at least one trait from him. Remember how Calhoun claimed he was trying to impress the girls with that on-side kick recovery in the Orange Bowl.? Well, the judge has a grandson who is quite the gridiron guru. After one of his multiple touchdowns at a recent game, the boy asked Uncle Joe Calhoun if the announcer had said who scored. “He just wanted to make sure the ladies heard his name,” Joe Calhoun said. That brought a grimace from the judge. Rockne Calhoun is convinced his grandson could be an All-American – if he’d just focus. “He needs to learn to quit looking at the girls,” Calhoun said.